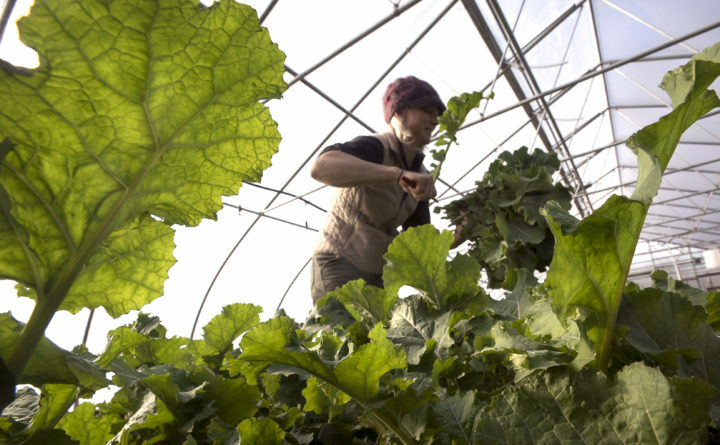 Clara Coleman harvests kale in the main high-tunnel at Four Season Farm in Brooksville in January 2017. For farmers, there’s been an important change here in the Pine Tree State in recent years: Maine’s growing season is, well, growing. According to the University of Maine Climate and Agriculture Network, the average length is 12 to 14 days longer than it was in 1930 and is expected to continue to increase by 2 to 3 days per decade. Meanwhile, farmers in 2018 experienced hot, dry conditions that meant they had to triage watering to keep their plants growing. Until recently, irrigation systems weren’t really necessary. But with northern Maine farmers having to cancel strawberry orders they couldn’t fill and dry conditions also affecting crops like potatoes and apples, that seems to be changing. So what can farmers expect from the 2019 growing season? Mounting scientific evidence shows the accelerating global impacts of climate change will continue to force Maine farmers to deal with droughts and flooding in 2019. According to predictions from Portland-based The Old Farmer’s Almanac, the 2019 growing season will be marked by fluctuations in rain and temperatures with April and June seeing above normal rainfall in Maine and possible dry conditions the rest of the summer followed by a rainy fall. This means Maine’s growers will continue in 2019 to alternate between irrigating crops during those dry spells and redirecting water when Mother Nature dumps inches of rain in short periods of time. Longer periods without rain can create drought conditions around Maine. Maine’s changing climate is also bringing new pests — and new pest-related problems. “We are seeing insects and diseases that normally would not be able to survive here making their way northwards,” Jackson said. Over the past decade, Maine growers have dealt with new pests including the brown marmorated stink bug, which damages a variety of fruit, vegetable and nut crops, and the spotted wing drosophila, a fruit fly that attacks raspberries, strawberries, blackberries and, in some cases, blueberries. Winter cutworm was seen more frequently throughout the state this year, according to the UMaine Cooperative Extension pest management office. As the worm’s name implies, it’s tolerant of the cold, and it damages a wide variety of crops, including lettuce, beets, carrots, potatoes, tomatoes and strawberries. Some pests haven’t made it to Maine yet, but could spread into the state in 2019. For instance, the spotted lantern fly — which feeds on 40 species of trees and ornamentals, including grapes, peaches and apples — appears to be making its way north. It could enter Maine as early as next year, according to Jackson. In general, farmers should keep eyes peeled for new or unusual pests in their fields. Any sightings should be reported to the local cooperative extension. It helps them collect data, and experts at the cooperative extension may have some tips for eliminating the problem. Maine has a growing number of farms. From the early 1980s to the early 2000s, the number of farms in Maine were steadily declining, according to USDA Census of Agriculture, which is conducted every five years. But after the 2002 census, things turned around. From 2002 to 2012, the number of Maine farms jumped from 7,196 to 8,173. And while the complete 2017 census has yet to be made available, the USDA has released that 8,200 Maine farms were counted in 2017. However, as the number of farms have increased, so have the ways for farmers to reach the public and market their goods, Roberts pointed out. When he first started farming in the ‘80s, farmers primarily reached consumers through farm stands and farmers markets, he said. Nowadays, Maine farmers are regularly selling their products through the internet, and to an increasing number of restaurants, grocery stores and institutions, such as schools. Many new farms in Maine are considered to be “small farms.” In 2012, about 61 percent of Maine farms were 99 acres or less. While 10 years prior, about 56 percent of Maine farms fit that size bracket. Tierney and her husband own and manage Cornerstone Farm in Palmyra with their two children and several apprentices, and in their opinion, there’s nothing wrong with a little healthy competition among farms. One piece of advice Tierney would give to farmers in this time of increased competition is to form connections with customers through direct interactions and social media. On Tierney’s farm, they post weekly pictures depicting life on the farm on Instagram and Facebook, and they interact with prospective customers regularly at farmers markets. Tierney also pointed out that social media is a great way to network and share knowledge with people involved in your trade. For example, she belongs to Facebook groups for flower growers and farmers markets. MOFGA runs an apprenticeship program for prospective farmers, but according to Colson, the overall number of applicants for the program have been down the past few years. Besides, many apprentices either decide that they are not interested in farming or they are interested in owning their own farm. Since they do not wind up working for the farms where they apprentice, it does not solve the labor shortage issue long-term. The H-2A visa program can allow farmers to bring in temporary seasonal labor via nonresident immigrants, but according to Colson, “farms often have a difficult time accessing that program.” Farms are required to pay the way for their workers and provide housing for their workers. “There are lots of hoops to jump through,” Colson said, “and there are only a certain amount of slots for the whole United States.” The gridlock on visas has been exacerbated by the Trump administration’s approach to immigration. For some farmers, the answer may be mechanization. Colson said industries like dairy and blueberries have been benefiting from mechanization in recent years. Other farms, though, are still interested in human labor. “A lot of farmers are interested in farm labor issues and how to find good, reliable farm workers,” Jackson said. Jackson said there will be a couple of workshops sponsored by the Department of Agriculture addressing the labor issues at the 2019 State of Maine Agricultural Trade Shows. Under Maine’s year-old food sovereignty law, towns may adopt local food system ordinances covering the production, processing and direct producer-to-consumer exchanges of those products free from state or federal regulations. So far 41 have adopted ordinances. With 500 municipalities in Maine, Retberg is confident more will adopt the ordinance this coming year. What will a new administration mean for farms? With Janet Mills in the governor’s seat, many small farmers are optimistic about the policy outcome for their land. “I expect good things under the democratic administration of Janet Mills at the Department of Agriculture,” Roberts said. He “fondly remembers” the attention paid to small growers by the last Democratic administration under Joe Brennan. With the new administration comes new leadership. Growers should pay attention to changes at the Department of Agriculture, Conservation and Forestry. The Bangor Daily News reported that the Mills administration is considering outgoing state Sen. Tom Saviello, R-Wilton, for the commissioner position. Saviello has a record for advocating for government accountability. He has served as the chairman of the Legislature’s Committee on the Environment and Natural Resources and also sits on the Legislature’s Agriculture, Forestry and Conservation and Government Oversight committees. The Maine Organic Farmers and Gardeners Association is part of a working group of agricultural stakeholders across the political spectrum working on an Agricultural Policy Platform, which Spaulding says will be presented to the Mills administration in late January or early February. The policy platform includes expanding broadband cellular service, increased funding for the University of Maine Cooperative Extension and promoting access to healthy Maine-grown foods. Farmers should keep an eye out for new programs and policies adopted from the platform come February. One thing is certain: Growing year 2019 will be different from 2018. BDN editor Sarah Walker Caron contributed to this report.